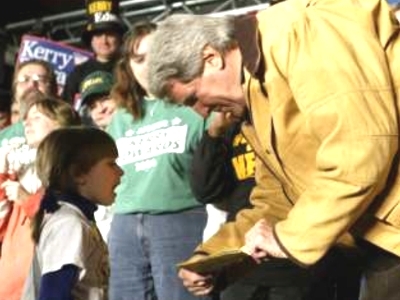 I'll bet my readers can do better than Reuters' original caption for this picture, which reads "Democratic presidential nominee John Kerry reads a note given to him by five-year-old Michaela Fishback (L) at a campaign rally in Waterloo, Iowa October 19, 2004. The note said 'John Kerry Rools.'" What does Michaela know now that she didn't know when she wrote her note? "John Kerry Drools," a side effect of Botox. "Sign the damned form 180!" Get UN approval for all actions. Make sure the French are consulted on all issues foreign and domestic. Rich, marry-able women don't need looks (or smarts). Create grandiose scenarios for later use (see "VietNam") - Bring 8MM camera as support. Never EVER use that spray-on tan stuff again! Say "idear" instead of "idea"... it makes you seem more folksy. Personal family issues are "fair game" during world-televised debates. Say "Jenjis Khan", not "Genghis Khan" because folks respect being educated by an elitist. If a group of determined veterans who know the truth about your past start to affect your numbers, have your DNC chairman, the MSM, and anyone else who has no soul start to repeat the mantra "now discredited" - It is a famous mind-trick made famous by Ben Kenobi. Pose in as many different "sport" photo ops as possible. It makes you appear masculine and an "everyman". Do not be concerned that "everyman" does not have excessive leisure time and finances for $8000 bicycles. --Addendum: For posing with football: eyes OPEN!... do not kiss own a** when hiking the ball. Do not exceed 3-days without injections of life-giving mixture - Botox, stem-cells, and gin-soaked raisins. "Mom said I have to be 18 to register in Ohio!" "It's a picture of 'The Hungry Caterpillar' kicking 'Le Petit Prince' like he was beggin' for it." That word's "integrity." It's okay, I used to have trouble with that one too, Mr. Kerry. "I got Grandpa, Eddie, and Lilly to sign their pictures, and I thought..."
"Grandpa O'Neill bet me you wouldn't sign it, but I heard mom say you never met a 180 you didn't like..."
"Under John Kerry's new plan for education, alternative spellings such as 'rools' will be acceptable as it is more important for every child to feel special than it is for them to read and write." "Mr. Kerry, It's pronounced, 'I-Deal', not 'I-Dear' ". "...and this is the picture of me on my boat in Viet Nam...did you know that I was in Viet Nam?" "So happens you're right Mr. Kerry - my grandpappy is indeed a Walton of Wal-mart - but I don't want you to ditch Teresa and hang for about eight years, by which time it'll be legal for you to marry me in Arkansas....so you can just keep your pre-nup proposal thing." Could I get a Big Mac, Fries and a Coke please!! "See kid, this is Cambodia. It's where that Evil Republican, Nixon, made me spend Christmas. So you tell your parents that if they dont vote for me that Evil Republican, Bush, will send you there in the draft." What do you mean George Bush is trying to steal my social security? And he wants to draft me too? "Whaaattt?!! I didnt realize you were an astronaut, when I wrote your qualifications next to that cute picture of you in the baby blue bunny suit, I thought you were the easter bunny"
I actually have a plan. Thought you could use one..."
"May I have your autograph Mr. Karloff?" Gee... whatever happened to working together to create a better world? Hurtful words can create feelings that get in the way of healthy communal action. It's hard to work with someone who's just kicked one in the groin. It's hard to shake hands with someone with a clenched fist. It's hard to bring a community together, or even two parties together when they use words in a way designed to denigrate the other, rather than the other's policies. Funny, I don't see any disagreement here with the idea that prescription meds in the US cost too much. I don't see any disagreement with the idea that this country shouldn't aspire to go from a five trillion dollar projected suplus over ten years to a five trillion dollar deficit. I don't see any disagreement with the idea that enviornmental quality is a vital issue for all of us, in that the air we breathe, if it is polluted, can make us sick. The water we drink, if it is polluted, can make us sick. The land we grow our food on, if it is polluted, can make us sick. I don't see any disagreement with the idea that if we destroy the quality of the oceans, we won't be able to catch fish. I don't see any disagreement with the idea that it would be better for the families who lose their sons and daughters in a foreign war if they did not lose their sons and daughters. I do see here a sports like mentality that it is a good thing to denigrate the opponent, sort of like razzing the shortstop... but how does that help get drugs off of our streets? How does it help Rush Limbaugh, and millions of others like him, beat their addictions? How does it encourage the recognition that we are all on the same team in this country we call, "The United States of America"? We may disagree on ideas, on methodology, on the chronology of what is most important and what to do first, but how does mindless ragging on another person for their thoughts or ideas, or proposals help us, (Get it, U. S.) work together to solve some of the problems that are facing us now and, if we don't solve them will certainly face our children? How does the use of words in hurtful ways help our children's world become a better place? I'd like to know, if anyone can answer me. people working together, respecting one another's ideas, and using a process to get to the answer for global warming, get to the answer to help find different energy sources so that the elderly and those on fixed incomes don't freeze this winter, or the next winter, or the winter ten winters from now, when energy prices will be even higher. How does mockery of another person for his or her ideas help us get there? I firmly believe that each person makes a difference. Each person has something to say. Each person has a role to play. I do not believe that mockery of another's best efforts helps US towards the common good. You should be ashamed of yourself for encouraging others to take jabs at an innocent little girl. I would hope that you would recognize this and publish a retraction on your blog. Beth, I have not, and am not, encouraging anyone to "take jabs at an innocent little girl." And I'd never permit that to happen here. Politicians have been posing for pictures with children as long as there have been photographs, and others have mocked the politicians (not the children) for it. That's exactly what I'm doing. If you think otherwise, ma'am, with due respect, you're very badly confused. Mike, those are all lovely thoughts, but they're off-topic. To the extent they're intended as a rebuke for making fun of Sen. Kerry, they're duly noted, but I respectfully disagree. Satire is a legitimate political tool precisely because it sometimes brings people to rethink their views and feelings and, perhaps, their votes. Well at least you have organized and coherent thought processes in order. But at least the little Dutch boy stuck his finger in the leaking dike, instead of just pointing at what was wrong with it. I myself would prefer action rather that contemplated complaints.. so as far as the snarky comments. Much more appreciated than bitching and moaning. Girl: oops I thought your name was "Herman Munster".. sorry. Tell your browshirts to leave that nice Mr. Dyer alone! She now knows that drools is spelled with a "D". Alright kid, gimme five large on W, with a two-challenge-spread. "Mr. Kerry, just look at the size of this bill that George Bush has dumped on me, my children, and my grandchildren! We'll never get out of debt! Please do something about this." Don't pick on my second cousin!!! !Michaela is a very sweet & smart little girl. She was very proud of the card she made for John Kerry.No one even told her to make the card she decided to do it on her own She is only five years old.